Free Shipping Included! 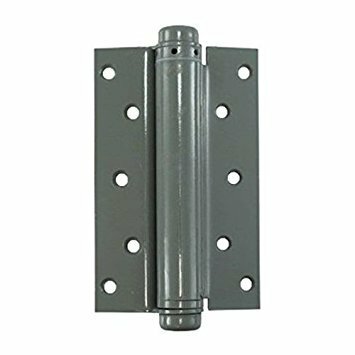 7” Inch Prime Coat Single Action Non-Handed Full Mortise Spring Hinges NYC-SPEC (Pack Of 2) by Global Door Control at Chat Central Huron. MPN: DH-5500SA77-USP. Hurry! Limited time offer. Offer valid only while supplies last. Packaged completed with a Pair (2) Single Action Spring Door Hinges, Tension Adjusting Tool, Locking Pins plus # #12 x 1-1/4" wood screws and 12-24 x 1/2" machine screws. •Height: 7" - Width: 4-1/2" - Square Corners - Door Thickness: 1-3/8" - 2" Thick Doors. •Use Of These Hinges Guarantee Door Will Return To Its Closed Position For Increased Security. •Screws Provided To Hang Wood Or Metal Door To A Metal Jamb. •Material: 120GA Steel. If you have any questions about this product by Global Door Control, contact us by completing and submitting the form below. If you are looking for a specif part number, please include it with your message.